I come by my love for decorating honestly. My sweet mom could make two chopsticks and a plastic Easter basket look like something from Southern Living’s front cover. My husband and I are in the contract/inspection stages of buying our new home in Nashville, and I will soon have plenty of opportunity to stretch my decorating legs. We are currently in the three bedroom rental for the next month or so. Now, I know that there are more important aspects to consider than the “pretty” of this new house (you know, like electricity…blah), but that doesn’t stop me from daydreaming about the finished product. I thought I’d share with you some recent inspiration and thrift store loot that will play into my plans quite nicely! I have loved a traditional Southern farmhouse look for a long, long time. (Joanna Gaines has made my inventory scarce because now everyone keeps buying it up! Haha!) 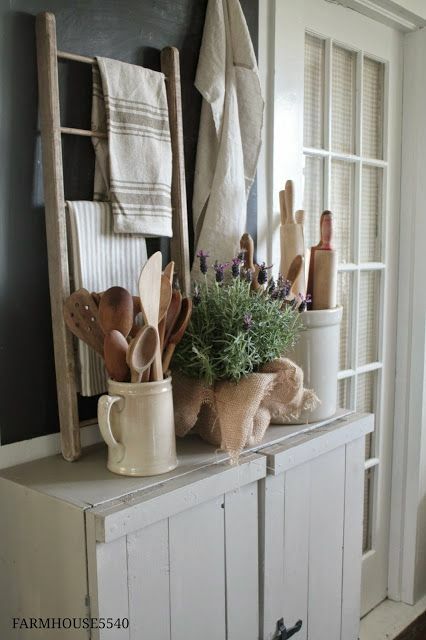 I feel that a lot of the farmhouse look is most easily conveyed throughout the kitchen and dining room. Whenever I think about our new home, my mind automatically jumps to these places… How I can arrange my furniture, shelving, and cabinets to reflect that neutral, textured goodness that comes along with farmhouse decorating? 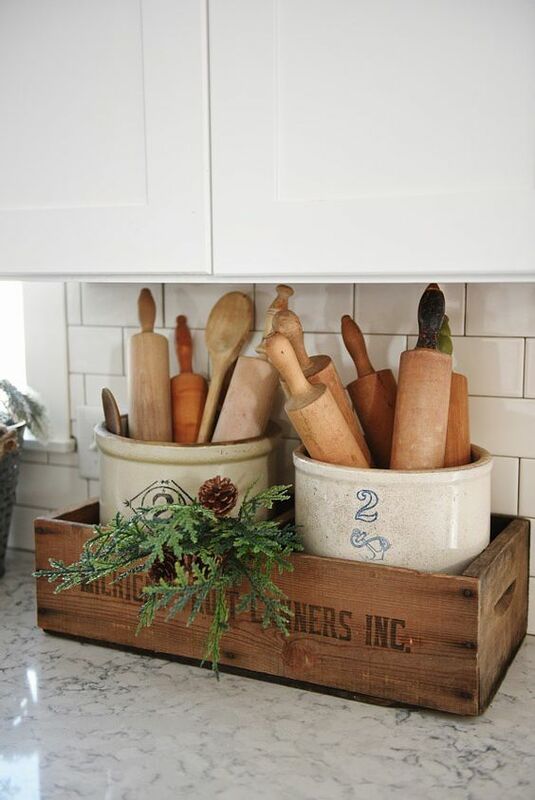 You can imagine my excitement when I came across a huge bin of wooden spoons and antique rolling pins at the local Salvation Army a few weeks ago – all for less than $5! 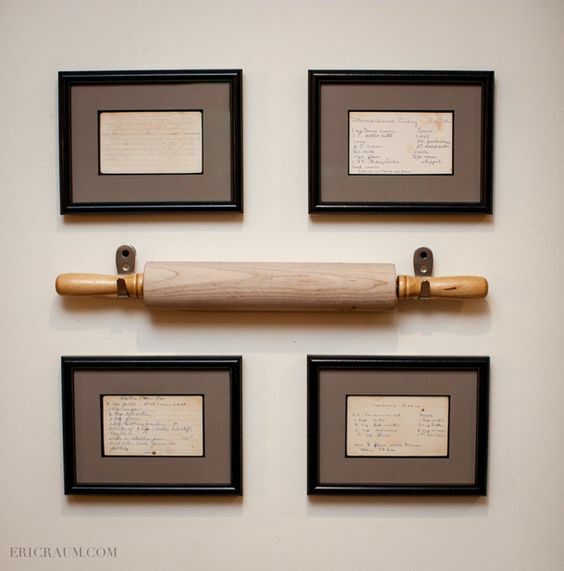 I have some photographs of my husband’s grandmother’s handwritten recipes that may work really well like third example above. I also picked up a few little neutral jars for less than $2, which I may end up spray painting a truer white. Sans stickers and cleaned up, these pieces are going to be great! One thing I am always on the lookout for is hand thrown pottery in a neutral or blue tone. These pieces are not easy to come by unless you are buying them new (which can be pricey), so when I see them I grab them up quickly! In the last few weeks, I have come across both of the dishes below and can’t wait to figure out how to display them along with the rest of my pottery. For now, these are a few small pieces in a big plan. I can’t wait to share pictures of the new house, before’s and after’s, and all the in betweens. Stay tuned and thanks for following along! Your love for “junking” equals mine! The farmhouse decorating style was popular around this area years ago. I was fortunate enough to be able to decorate a country house during this period. I also love old pine pieces. Not too much into oak even though I ended up with a few pieces. Don’t move without contacting me. I may have a few things for you. Ms Faye, is there anything you can’t do or aren’t good at? I don’t think so. I will definitely give you a call when we get closer to moving! Thank you!! !